Not so long ago while doing some holiday research I discovered that Milan’s Malpensa airport offers a wider selection of destinations at better prices than our local airport Nice. Having taken everything into account – fuel, motorway tolls, airport parking and even overnight hotels – we found it was cheaper to fly from Milan to Scotland despite the 3.5 hour drive. As far as I was concerned there was also the added bonus of a flying visit to Milan itself. If a flight from Malpensa meant we got to have a couple of meals in Italy and a blast of Italian culture then all the better. So what did we get up to in Milan in approximately six hours? First on the agenda was breakfast. The airport hotel’s offering was uninspiring and soulless so we headed straight into central Milan to find coffee and pastries. The autumn sun was shining brightly on the corner of a little piazza, spotlighting a chocolate café packed with chic Milanese lazily reading the papers on this mid-week public holiday. 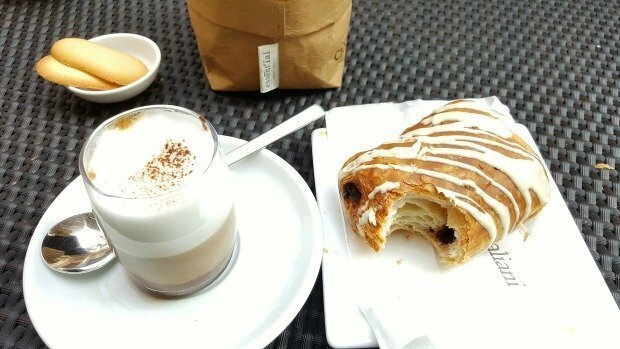 We found a comfy sofa in the sun – outside in November – and ordered the most delicious rich thick hot chocolate for the little kid, with sticky pastries and plenty of coffee for me and JF. What could be more perfect? Once satiated we headed off to join the queue for tickets to the Duomo. It moved reasonably quickly as we used the self-service machines, however the next queue, for the stairs up to the roof, didn’t move so fast. Tightened security meant that everyone was being frisked down and having bags checked – an unfortunate but reassuring necessity these days. And then we started the long, spiral climb up to the roof of the cathedral. 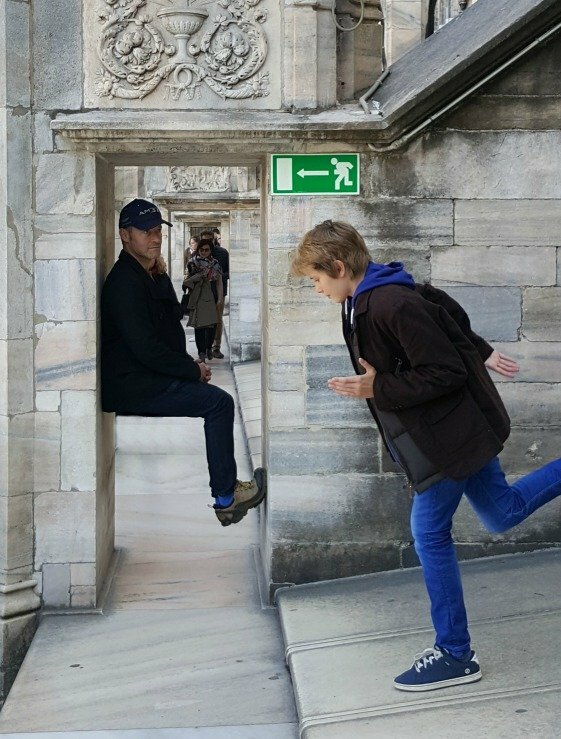 (For info there is also a more expensive option to take a lift if several hundred steps in a narrow staircase isn’t your thing). 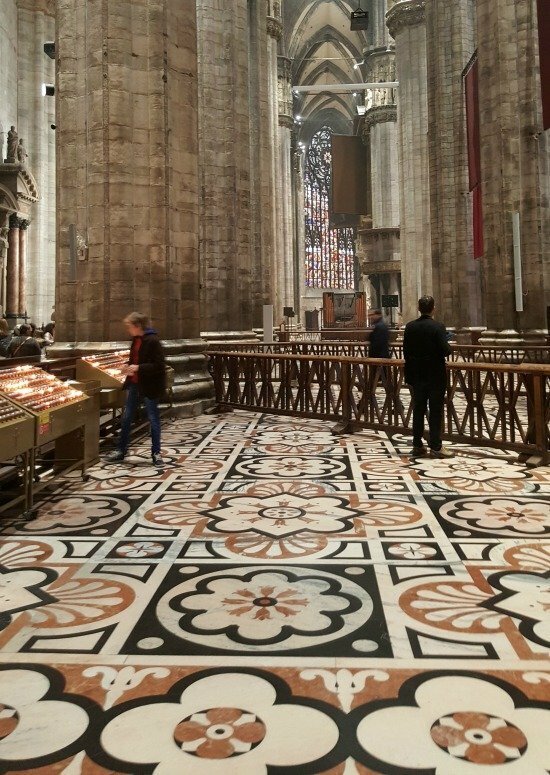 The Duomo di Milano is an extraordinary building that doesn’t appeal to everyone owing to the many architectural styles used over the six centuries it took to be built between 1386 and 1965! Oscar Wilde described it as an “awful failure….monstrous and inartistic”. In contrast Mark Twain wrote “what a wonder it is! So grand, so solemn, so vast! And yet so delicate, so airy, so graceful!” Differing opinions indeed! 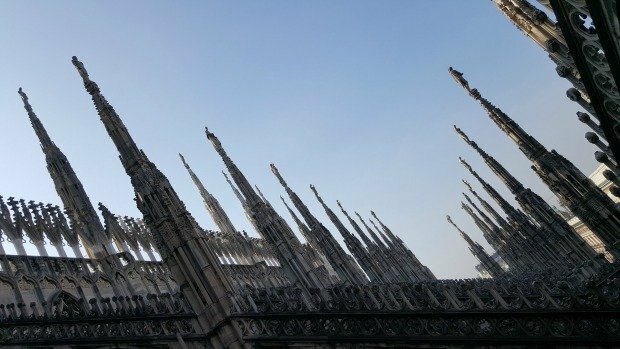 But whether you like it or not, it’s a place full of superlatives: the biggest Gothic cathedral in the world, the largest cathedral in Italy (and 3rd largest in the world), the most spires of any cathedral in the world, the largest organ in Italy…. 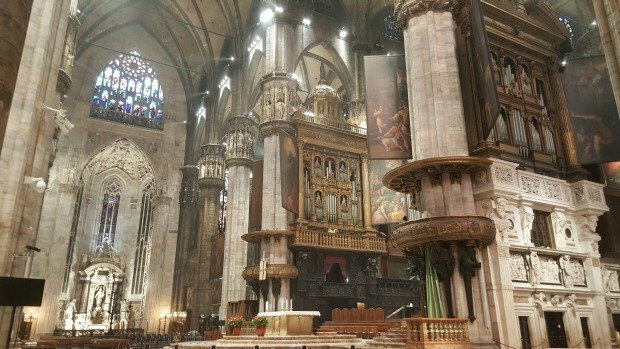 It has (around) 3400 statues of saints, animals and monsters (hard to find an exact number as everywhere I looked quoted something different so I’ve taken the number from the official Duomo website hoping they know best) and 55 stained glass windows. A fun fact for Frenchies is that one of those statues is of Napoleon Bonaparte who was crowned King of Italy in the cathedral in 1805. Personally I love this wedding cake of a cathedral, for the detail in the carvings and sheer magnificence of its size but especially because you can clamber all over the roof getting up close to many of those thousands of statues and spires. 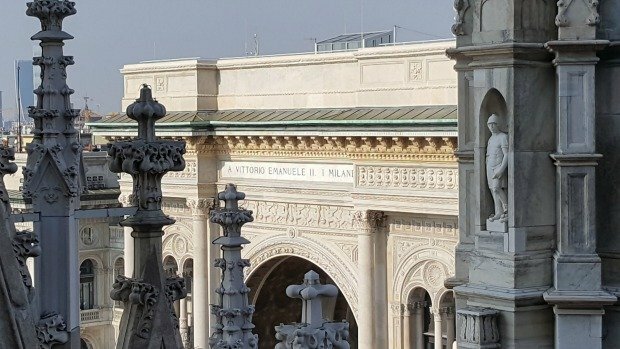 It’s really quite a surreal experience walking around on the top of a cathedral, literally on the roof, not just along walkways and corridors. As an added bonus when we visited we had perfect weather and could see for miles. Once we’d finished on the roof we went inside. 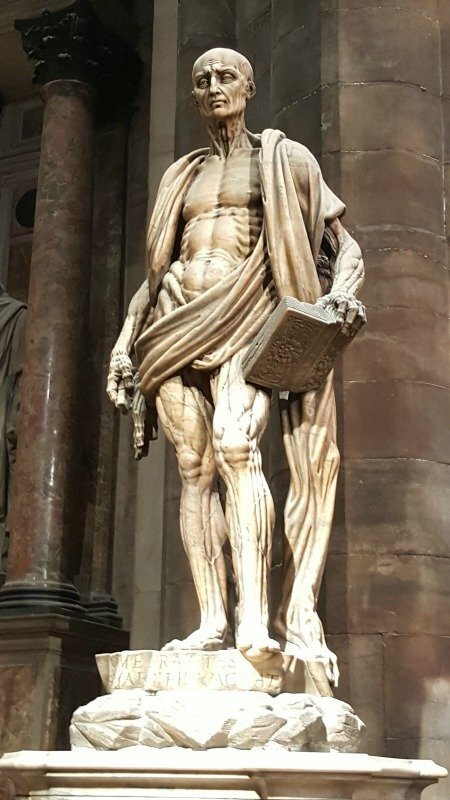 Of all the details in the vast interior, there was one that we’d all remembered from our last visit some years ago: the gruesome statue of St Bartholomew Flayed by Marco d’Agrate (1562) portraying the saint carrying his skin across his shoulder like a shawl. Quite fascinatingly hideous in a realistic and rather gory way! Having taken our fill of the great cathedral our stomachs were telling us it was time to eat again, so we set off to find a pizzeria recommended by friends. 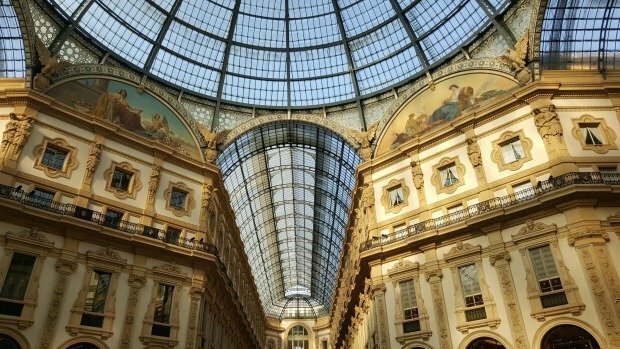 But no visit to central Milan would be complete without a little window shopping in the grand Galleria Vittorio Emanuele II just next to the cathedral on the Piazza del Duomo. Built between 1865-1877 this gorgeous glass-vaulted arcade is considered the world’s first shopping mall! Can you see us reflected in the window decorations? And so to lunch. We’d been told about a little place that was always so busy you had to wait outside, and while waiting you were offered slices of pizza and glasses of prosecco. It seemed too good to be true, but this is exactly what happened, and the wait was only about 15 minutes. Inside the tiny colourful restaurant we were handed the menu which was only in Italian, and only had three choices. As there were 3 of us, it was a simple choice to order one of each pizza. Apart from margarita, we didn’t know what we were getting, but the smells were heavenly, and judging from the clearly appreciative local crowd, the food was good. Oh yes, more than good, de-lish-ous! 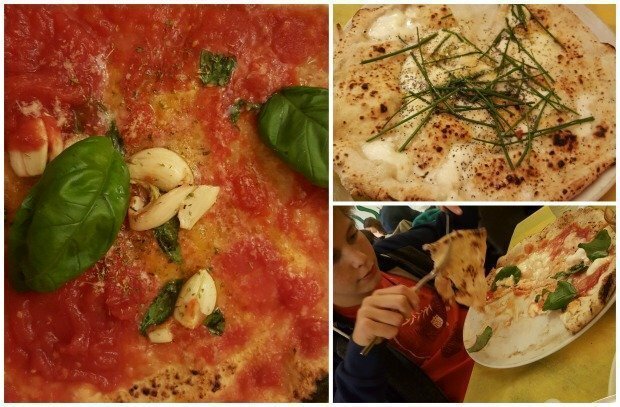 The other two pizzas turned out to be one with a tomato base, fresh basil and whole cloves of garlic, and a hugely original one with mozzarella, parmesan, chives and poppy seeds. After lunch we jumped back in the car and drove home in time for tea. 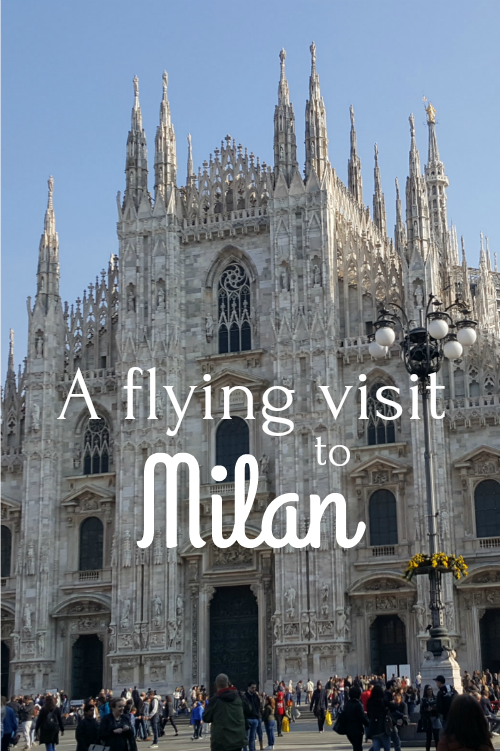 So there we have it; our flying visit to Milan. Approximately six hours to get a little fix of Italian food and culture, on the way home from a few days in Scotland. It extended our holiday in a way that felt like more than just a brief encounter, and knowing we’re so close and can go back again whenever we want means we didn’t have to cram huge amounts into one day. 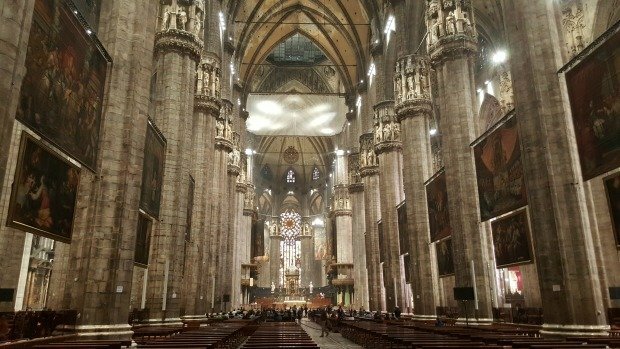 I’ll leave you with a few more photos of the interior of the Duomo. And some more photos from the roof. 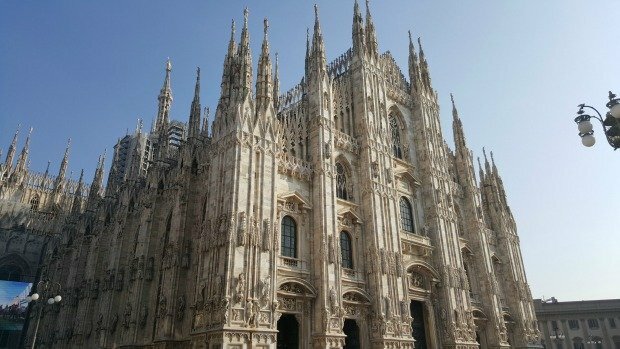 Have you been to Milan? 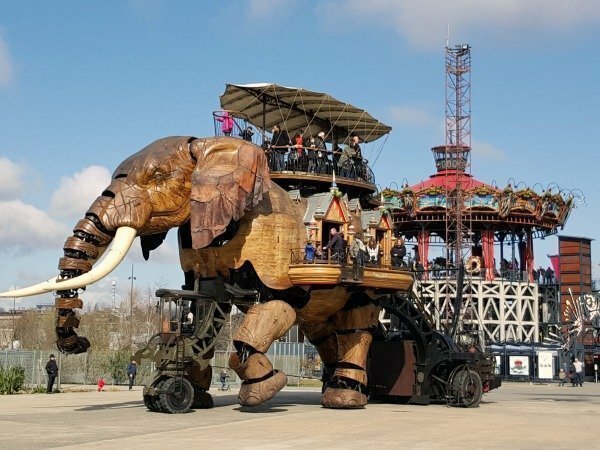 Would you go out of your way to save money and add an extra dimension to your holiday, or does this seem like a bit of a faff to you? If you enjoyed this please PIN it! 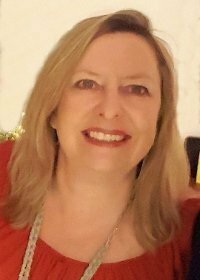 Hi Pheobe – Pizza place sounds divine – any idea what it was called? Hehe – absolutely. Great to re-read for #citytripping. 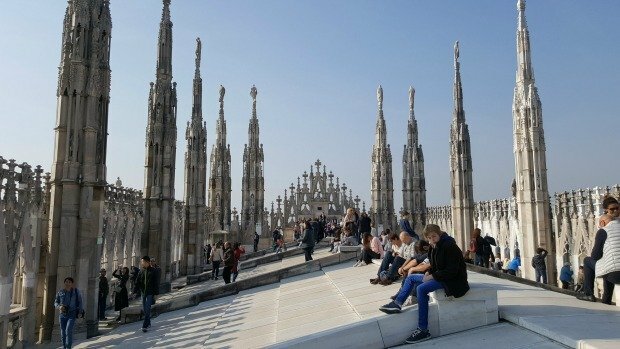 We need to go back to Milan and when we do we’ll definitely go to the top of the cathedral. Just love your photos! As far as flying visits go, I think you did a good job 😉 Looks like loads of fun! 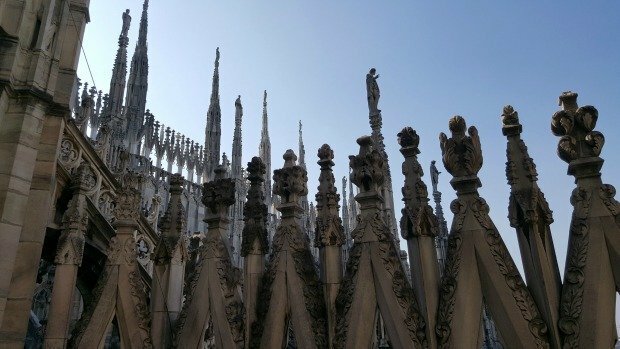 I’ve not been to Milan but I love this idea of seeing it on a flying visit. 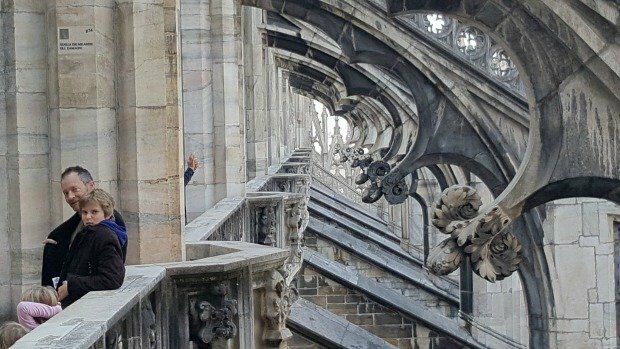 The Duomo looks incredible and so do those pizzas. Interesting about flying from different airports. We have a number to choose from (Stansted, Luton, East Midlands etc) and it can make a big difference in price. The hot chocolate was really…really good! 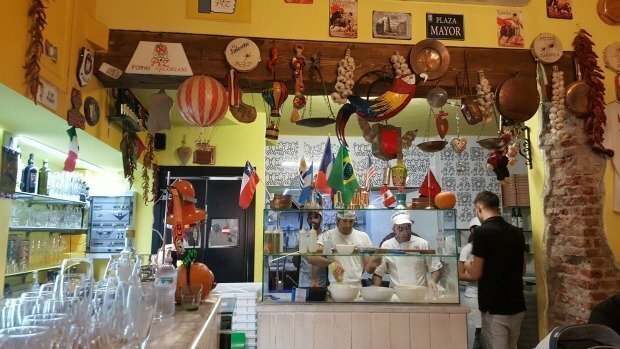 The owner of that place really understands how to capture a clientel, it was such an easy and delicious way to wait for a table! But what a unique experience to be there with the Pope! 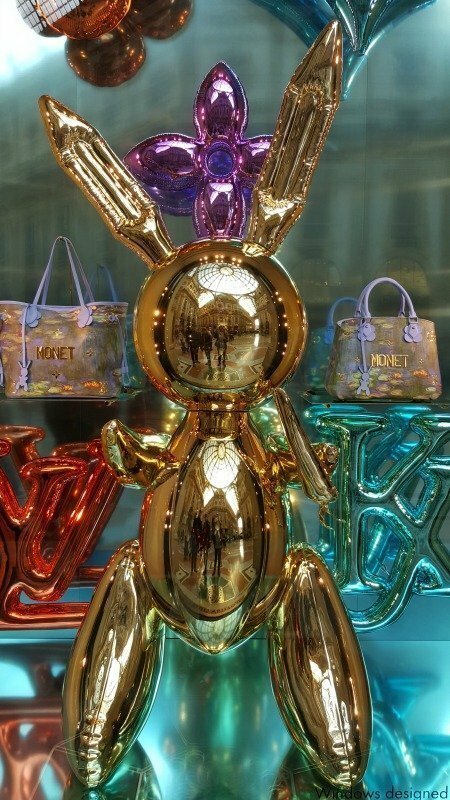 It’s a great city for a girly trip – shopping, food, coffee, cocktails and a little bit of culture! It really does appeal to teens I can vouch for that! 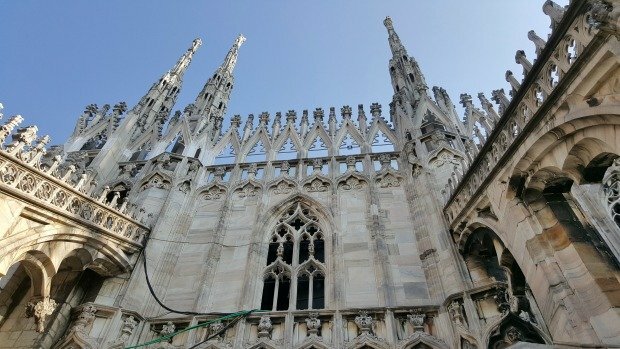 I think it’s hard not to love the Duomo, but that’s just my personal opinion! The statue is remarkable, but not actually pleasant! We have been to Italy for breakfast a few times…the beauty of living so close. And yes…we are doing it again, this time to fly to New York at Christmas – we found a great bargain from Malpensa! 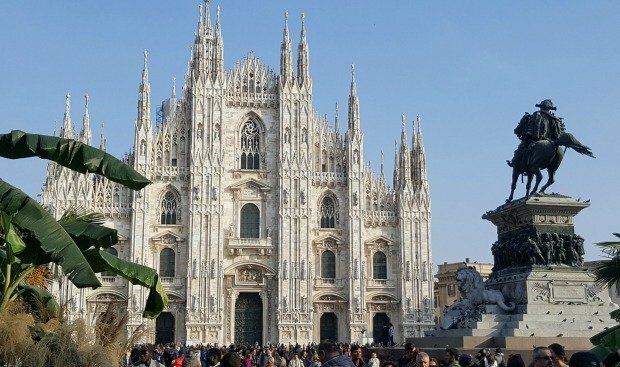 You’re right, Milan isn’t as gob-smackingly beautiful as many other Italian cities but it has enough pretty good buildings to keep the visitor happy. 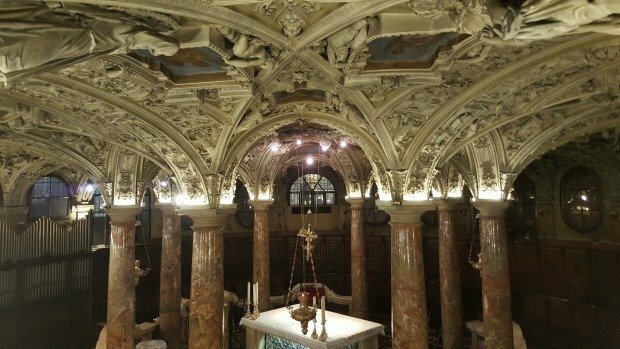 It also has The Last Supper which I’d love to see but have failed both times I’ve been to Milan as it has to be booked months in advance…no room for spontaneity when it comes to Leonardo de Vinci! I’ve been to the Navigli area but it rather underwhelmed me I’m afraid. Perhaps I need to give it another go. As for restuarant suggestions, I’m always happy to receive! There’s always a next time Leona! I love your description “frightened porcupine” it’s very apt even though I think it’s a beautiful frightened porcupine! How I wish we could just wonder in and see The Last Supper. 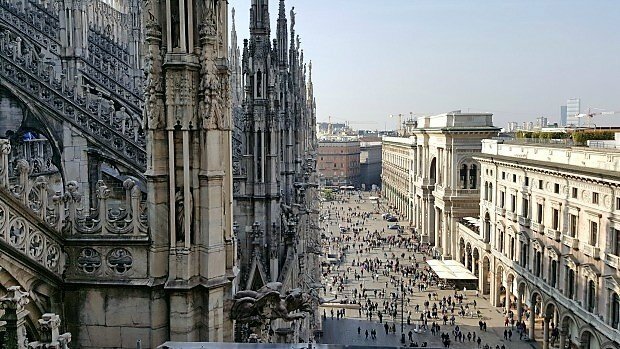 Nowadays you have to book so many months ahead that both times we’ve been to Milan it’s been full because we’ve been too spontaneous. One day we’ll think ahead and go specially to see it. Well done climbing the steps pregnant, I know I wouldn’t have liked to do that. 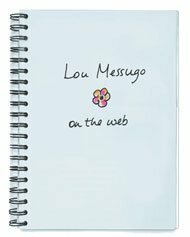 Your boys would love climbing on the roof Clare…how about flying to Milan for a trip to Lou Messugo next year!!! I had no idea he was King of Italy I must admit! I’m always all for adding new experiences to any travel situation, glad to hear you like to explore in layovers too. Thanks Alix, you really must come and stay, it’s perfect for a long weekend (or more) from Paris. Hi Phoebe! 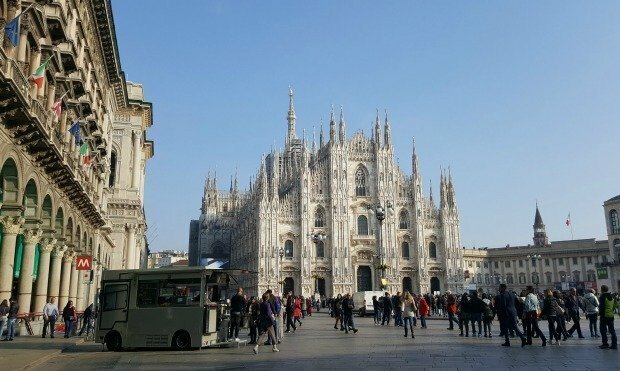 I love Milan and you took some gorgeous photos during your day there! Interesting that you could save money by flying from Milan. I love the idea of adding another city to your itinerary too. I see you live in Nice! 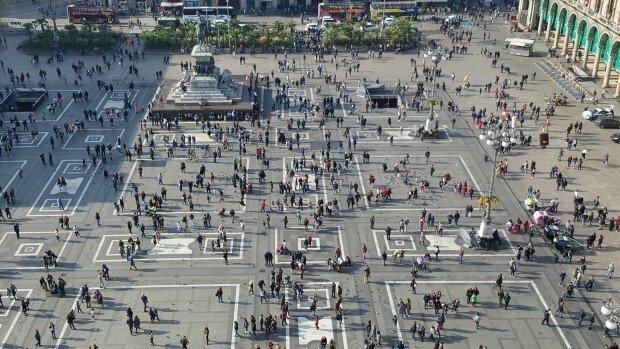 We live in Paris and (of course!) LOVE France too. We’ll have to come and check out your gite one of these days. I’m definitely in camp Twain – Wilde is wrong! I mean, just the fact you can go on the roof is amazing but once you’re up there – I could have stayed all day! I was pregnant and climbed all those steps with a big belly! I love that arcade nearby too. I will definitely be bookmarking that pizza restaurant for next time. I paid a flying visit to Milan once. I slept on the marble floor of a school (not over comfortable, but pretty cheap), glanced at the Duomo, which reminded me of a frightened porcupine (my architectural tastes were decidedly sober and Anglican), and wandered in to look at The Last Supper in the Santa Maria delle Grazie Convent (in need of attention, unguarded and no charge, and altogether pretty classy). I was 17, hitch-hiking to Greece, in 1955. I dare say things have changed a bit since then. Oh no definitely not a faff, but then I love add-ons like this. How special, ‘Let’s go to Italy for breakfast, I hear they do a great coffee! !’ I guess the test will be whether you do it again? !